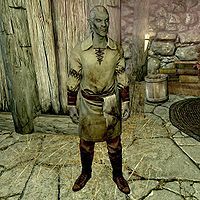 The Attendant is a Dunmer bandit wizard found in Redwater Den, where he works the Redwater Skooma booths. He carries Redwater Skooma and a Redwater Den Backrooms Key. If you go through the quest The Bloodstone Chalice, he will appear as a Vampire's Thrall on your way out of the area, though he will go about his duties as normal. This page was last modified on 27 December 2013, at 16:25.